CITY CENTER, April 7, 2011 (Daily Dispatches) – The red digits on the clock on the newsroom wall climb steadily towards 10:30am. Guys in shirtsleeves thumbing BlackBerrys march past to meetings. Desk-phones peal. A plasma TV shows a smiling Kenyan politician spilling out of a shiny Mercedes by a smart office block 4,000 miles away in Europe. He is one six men accused by the world’s war crimes court of organizing election violence here three years ago. He and two others will appear before judges in Holland for the first time this morning. It’s going to be a busy day for Robert Nagila, a news reporter here at NTV, one of Kenya’s leading television channels. Bounding down the stairs, cameraman Steve Mwei three steps behind him, Nagila is heading to Nairobi’s tea-shops, to watch Kenyans watch the proceedings, gauging what he calls “the mood of the people”. A short dash across the city and we’re in Lowi’s Place, a fried-food joint in downtown Nairobi. Customers sit glued to the television. Ekaterina Trendafilova, the court’s presiding judge, reels off the accusations – murder, forcibly transferring people, persecution. Nagila’s there, on his feet, recording a piece to camera, before sitting to interview Ambrose Muga, Lowi’s owner. He barely pauses as a plate clatters to the floor in the kitchen. A dozen questions later, we whirlwind out the door. Round the corner, a security guard bars us from filming an economics student Nagila spotted watching the court appearances streaming live to his Nokia smartphone. That would make a great bite in his report. For the first time, Nagila is brought to a stop. A frown. A deep breath. “I’d hate to miss this,” he says to the student, John Kihumba. He looks up and down the street. Pauses again. The frown lifts. A minute later, Kihumba’s being interviewed under a tree in a nearby car-park, away from the guard’s reach. “What are your expectations of the case?”. “Can it really be an end to impunity for people accused of election crimes?” “What will happen next, do you think?”. Even in the taxi back to the office, Nagila’s relentless. He takes Mwei’s camera and starts grilling the driver, the same questions, in Kiswahili this time. It’s almost a relief to see him disappear off into the edit suite to craft his package for the NTV at 1 bulletin, which the red digits on the clock tell us starts in 28 minutes. Nagila, 38, is one of a new breed of newsmen and women flexing their journalistic muscles as Kenya’s once repressive media landscape opens up. Under Daniel Arap Moi, the former president, ‘news’ was a run-down of what the leader did that day. Critical voices were silenced, and journalists were cowed by the threat of sanction from timid press owners. Today FM radio stations clog airwaves. 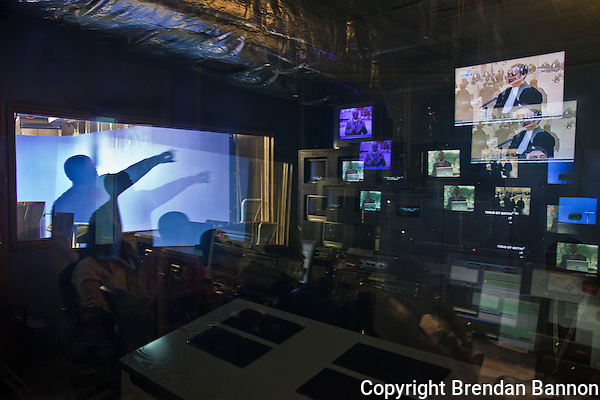 There are eight television stations, up from just two in 2000. At least five daily newspapers have print runs in the tens of thousands with circulations growing at up to 6% a year. The Daily Nation, NTV’s sister paper, prints 200,000 each day. And the gloves are coming off. Front pages rarely shy away from blasting broadsides against caught-out politicians or businessmen. News bulletins are peppered with political analysis. Everyone is fair game. Because of this, Kenyan technicians, producers, cameramen and reporters schooled in post-graduate courses overseas are flocking home to queue for jobs. 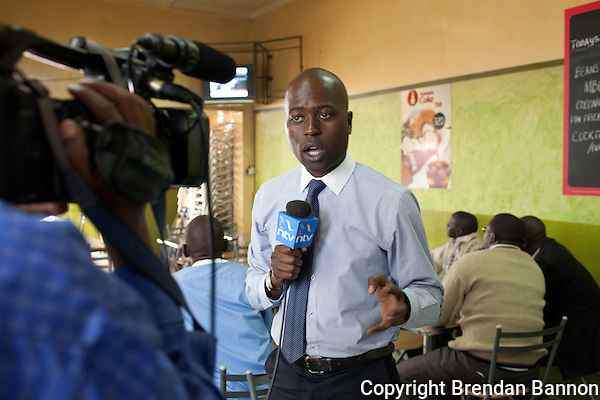 Working his way up through radio, he is now one of the pool of television reporters at NTV. His investigations into the brutal mungiki sect, a mafia-like protection racket based in Nairobi’s slums, earned him both death threats and awards. “There is a great demand from the audience for us to provide them with high quality output,” said Linus Kaikai, managing editor of the Nation Media Group’s broadcasting division and Nagila’s boss. Nagila reappears from the edit suite. The 28 minutes are up. 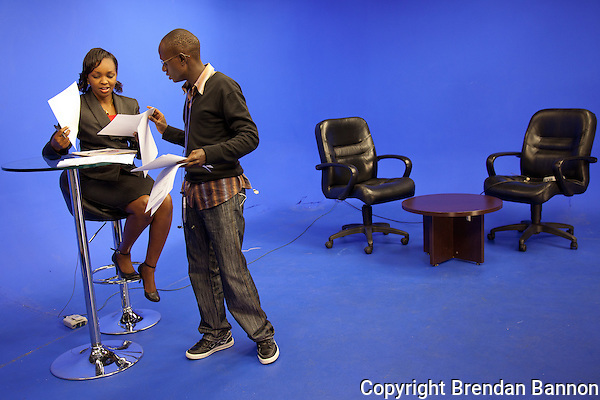 In the studio, Peninah Karibe, the NTV at 1 anchor, perches herself on her stool against the blue-screen backdrop. In the control room next door, before a bank of monitors, phones ring with final running-order changes. Nagila’s “mood of the people” package is slotted in at the last minute. Allan Kiprop, the director of news, clicks his fingers. The countdown starts, 10 seconds, nine, eight, seven. On the clock on the wall, the red digits mount steadily to 1:00pm. Related: Brendan’s full slide-show of images, Mike’s explainer on Kenya’s post-election violence, and links to stories in Kenya’s April 8 newspapers about the hearings. This entry was posted on Thursday, April 7th, 2011 at 3:53 pm. It is filed under Features, Working. You can follow any responses to this entry through the RSS 2.0 feed. Hi, these pictures and the story is beautiful. Thank you! I would like to learn more about the politics of Africa and what the politicians are doing to improve the lives of the people. I seems like there are also extreme issues in transportation and housing so I would like to learn about what people are doing to resolve this situation. when my professor first explain to the class about the daily dispatchers that was going on in nairobi and their mission to express “real time reporting” on the people of nairbi i though this project would have a huge impact on the Students of Buffalo State College because it is a great way to show Cultural Differences but i was wrong after viewing the stories and the photos myself i notice that my class was the only students that were even looking at the pictures and everyone else was walking by so fast that I don’t even think they know what we were looking at. Daily Dispatches is an innovative way for journalists, corporations, organizations and individuals to use images and words to reach audiences with regular engagement that builds connections through daily-growing interactions. We take one focus - any city, any company, any group of people - and explore it from all sides, presenting the discoveries on a daily basis through a website, an ever-expanding art exhibition, or a newspaper series. Daily Dispatches' first outing was in Nairobi. There we showed a fast-evolving 21st-century African city unfolding day by day in real time. We searched out stories from all corners of Kenya’s capital that painted a compelling, informative and surprising portrait of the city, and the lives lived by those who call it home. Each day, we sent our images and reports back to a series of US universities and colleges we worked with, who in turn printed them and mounted them in an exhibition that grew day by day. What you see here is the online archive of that. What’s next for Daily Dispatches? Jenny L. on Arrest this development? "A fascinating experiment which should help the world understand in breadth and depth the daily concerns of urban Africans." "An ingenious idea. By creating a website which is for the people and place where reporting takes place, and including a feedback loop, this is a model for the future of journalism. An innovative approach, developed with a clarity of purpose and completeness of vision." "Mike and Brendan both have a voluminous curiosity, and a sensitive and thoughtful approach to their subjects which always brings out surprises in their work. Daily Dispatches looks like it will really unleash their talents, and I think we should all take note of this as an innovative new way of gathering, crafting and reporting stories"
"Brendan has a track record of making great imagery and also taking new angles to work that has been presented before. With Daily Dispatches, he has found a way to attach his work to schools in the US. I think this is the first time I’ve seen this, and I’m thinking it could be window into the future of this type of project."